Last month I entered a giveaway at Meal Makeover Moms. 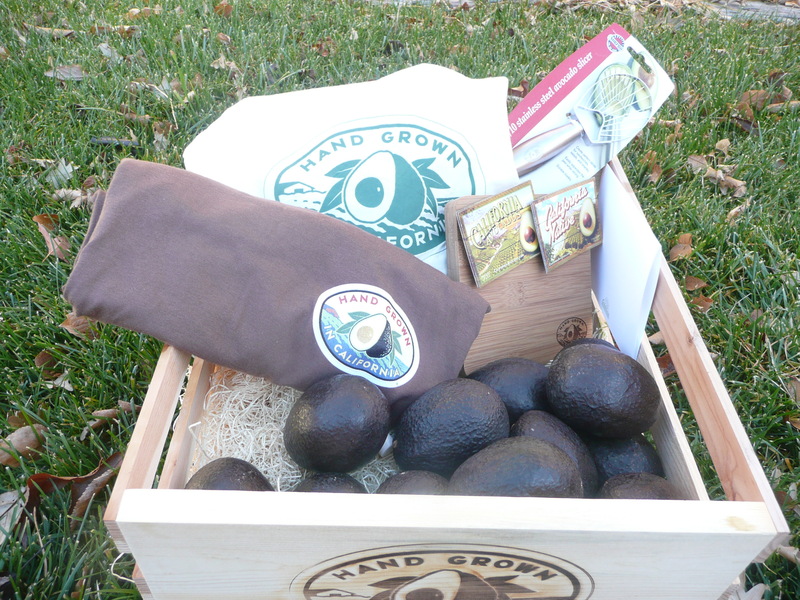 The prize was a gift basket courtesy of the California Avocado Commission and a gift certificate to Williams-Sonoma. Well, I was the winner! I rarely win drawings, so this is very exciting. The prize basket arrived this weekend. It included a small cutting board, an avocado cutter, a t-shirt, avocado lip balm, and 12 avocados! It was all housed in a very nice crate that I will use to harvest veggies from the garden next year. Unfortunately all of the avocados are ripe and ready to eat, so they need to get used quickly. I offered some to my mother-in-law, who eats a lot of avocados, but she had just purchased some and didn’t need any more. So it looks like we will be eating them all ourselves. Use at least one recipe from the California Avocado Commission’s website. Try something unexpected like an avocado dessert. Make at least one entree that is NOT Mexican-inspired. I will report the results of my challenge at the end of the week. Does anyone have any avocado recipes to recommend?